They call you Lasers, regulators, or, out in the Scylla Outzone, shinestars. To the lawless denizens of the Bleed, whether they be pirates, gangsters or tyrants, you're known in less flattering terms. According to official Combine terminology, the members of your hard-bitten starship crew are known as Licensed Autonomous Zone Effectuators. You're the seasoned freelancers local leaders call when a situation proves too tough, too baffling, or simply too weird to handle on their own. In the abandoned fringe of inhabited planets known as the Bleed, you're as close to a higher authority as they come. The cybes, former humans radically altered by cybernetic and genetic science. The eerily beautiful, nature-loving, emotion-fearing Balla. 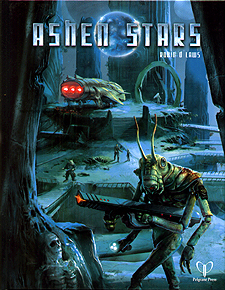 Ashen Stars also contains extensive, steamlined rules for space combat, 14 different types of ship, a rogues gallery of NPC threats and hostile species and a full adventure to get you started in the Bleed.